1 Primitivism sounds like cave man art, but it is not. It was a style of art full of jungle scenes, wild animals, and bright colors. Artists showed their "wild side" in their paintings. 2 In the late 19th century, European countries invaded Africa. African tribes had many new kinds of art. They used geometric shapes on their masks. They used vivid colors. They had a different culture. European artists thought it was exciting. They decided to paint in a new way. They wanted to get back to nature. They wanted to paint in a less formal way. 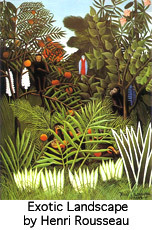 3 A French artist named Henri Rousseau started Primitivism. He was a customs official who never took art lessons. He didn't start painting full time until he was 40. When he retired, he visited gardens in Paris and painted landscapes and animals. Other artists thought he was amazing. Picasso liked Rousseau's art very much.